Grant Fordham finished MGA's flight training program in record time, going from private pilot to flight instructor with six licenses/ratings in a little more than a year. High School: Trinity Christian School. Family: Derry and Janice Fordham (Parents), Brittany and Heath Helton (Sister and brother-in-law), and fiancée Ashley Yanken. Current Employment: Certified Flight Instructor at MGA Aviation. Degree Objective: Bachelor of Science in Aviation Science and Management. Career Goals: "My career goal is to fly for a major airline within the next 8-10 years. In the short-term, after reaching my flight hour minimums, I want to fly for a regional carrier as a First Officer on either Embraer E-175’s or Canadair Regional Jets (CRJ-200/700/900)." He chose Middle Georgia State University because ... "Its geographic location and costs were what I was looking for. I started out taking classes on the Dublin Campus and enjoyed completing all of my core classes there. Being from Dublin, it was very convenient and I was able to be close to my family." The greatest thing he discovered about Middle Georgia State was ... "The aviation program and its wonderful benefits. Being the state’s only collegiate aviation program, I quickly realized this was the place I needed to be to become a professional aviator. With a fleet of 24 aircraft and a very knowledgeable and experienced staff, this is the best training environment in the state!" His greatest academic experience so far as a Middle Georgia State student has been ... "Becoming a certified flight instructor barely 13 months after becoming a private pilot. 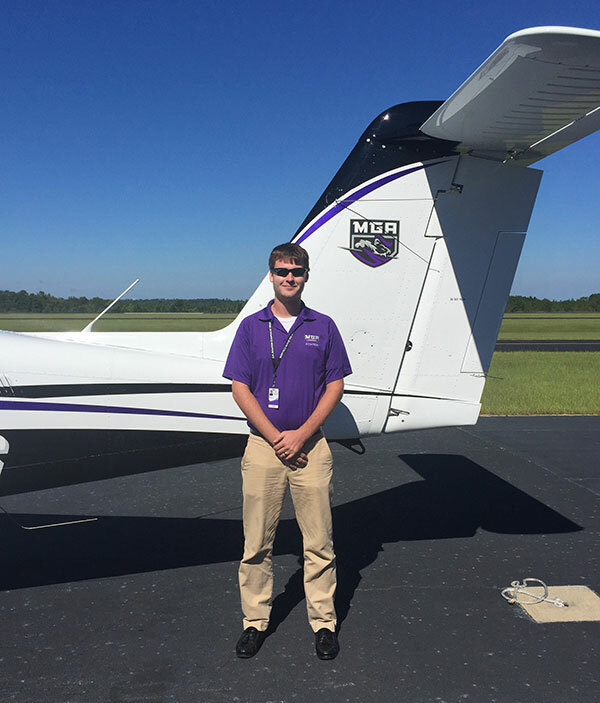 I am proud to say I went from zero flight time to a staff member here at MGA Aviation in under two years while completing my degree." To him, greatness means ... "Going above and beyond what is expected of you and accomplishing your goals. Striving for greatness and always improving my flying ability is important to me. With each rating or license, I have seen consistent improvement in my skills." One thing people don’t know about him is ... "I enjoy riding dirt bikes and have since I was five years old." In five years ... "I see myself instructing at MGA for the next year, followed by going to either a regional airline or flying for a charter company somewhere in the Southeast."